So You Want To Move To Berlin and Work For (or Build Your Own) Startup? I get it. San Francisco is so 2003 – when did 6th and Mission become hip? Buzzfeed is giving you 22 reasons to move here (by the way, they are sooo wrong about no one paying for the Ubahn – you will be caught your first time without a ticket) and, according to the New York Times, half of Brooklyn’s DJs have already immigrated. While some say that Berlin is over, if your goal is to work for a startup, or build your own, this could not be further from the truth. Berghain may have fallen from grace, but the startup scene is just heating up. With the (far too many) accelerators and ever expanding tech hubs, people spent too much time last year asking: is Berlin just hype? It could have gone either way, but only three months into the new year, Berlin has proved that it has staying power. From Delivery Hero’s whopping $88m funding round this January, to TVSmiles’s 7 million series A, to Outfittery’s 13m round, Berlin is settling into its startup ecosystem skin. 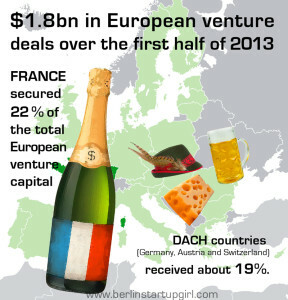 This means more opportunity for you entrepreneurial expats to come in and conquer the scene. 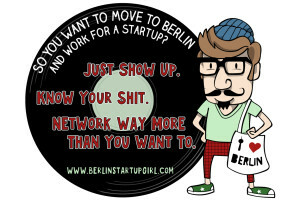 Want to move to Berlin to work for or build your own startup? Here’s my advice. And I’m back! 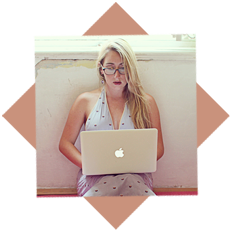 After a two month stint in California and a jaunt to Nicaragua, I have returned, and Berlin Startup Girl lives on. Last night, for my first event in 2014, I headed to Hy Summit. As many of you know, one of my favorite pastimes is complaining about events in Germany. The organizers typically mean well, but the small details are lacking. Like, who has a tech event and doesn’t offer wifi? Or, an event in November without a coat check? Networking here is awkward enough without having to hold onto your jacket, scarf, gloves, plus an ipad. So when I walked into Hy Summit yesterday, I had a moment of “Wait, what happened to Berlin in the last three months?” I’d thought of Hy as one step above a Meetup, but they proved me dead wrong. They stepped up their production value, and offered a coat check, wifi, friendly and efficient check-in people, the right amount of seats, and GET THIS headsets for the English speakers so the event could be translated. It did not feel like a German event until the VC sitting next to me complained that they were not running on time, probably due to the government official who was from Bavaria, which may have correlated to his tardiness or was just an additional anecdote. To my neighbor’s credit, the event did start thirty minutes behind schedule. Hy Summit kicked off with a surprisingly un-cheesy video about the future of innovation, featuring music by Moderat. It did not however, include any women, as noted by WomenShiftDigital. On that note, the women in the crowd (not counting staff or waitresses) probably accounted for 5% of the audience. Hy did include Anna Alex of Outfittery (which just announced in February a €13m funding round led by US-based VC Highland Capital Partners) in the panel (w)hy Berlin?!. Next up was the aforementioned Bavarian, Alexander Dobrindt, the current Federal Minister of Transport and Digital Infrastructure, but since my translation headset did not work, I spent the ten minute talk noting the other people who were listening via headsets – I counted less than ten. Ijad Madisch, the co-founder of ResearchGate, turned out to be the most engaging German presenter I’ve ever seen. Yes, his company is one of the most interesting out there as it is solving a real problem, and Bill Gates is an investor. But Ijad’s story of how he started the company despite being advised not to, and why he did it in Germany, was inspiring. The presentation also featured photos of fingers grafted onto mice, stories of Russians solving mathematical problems, and lots of references to hair loss. Ijad is so unbelievably charming someone needs to make him the poster child of German startups. The (w)hy! Berlin? panel was made up of Ciaran O’Leary of Earlybird, Anna Alex of Outfittery, and Lucas von Cranach of THE Football App. It kicked off with Hans, the moderator, asking about the good, then the bad, of Berlin. Ciaran’s point really stuck – Berlin is the only city on this side of world that is inspiring, English-speaking, and focused on Entrepreneurship. Talent was mentioned as another plus. When they discussed the bad part of Berlin, Anna shared what was, by far, my favorite quote of the evening: “We knew it was a waste of time to talk to German investors.” Way to call it like it is! There isn’t enough capital here, the Germans are too risk averse, companies sell too early, and raising money is much more challenging than it should be. Peter Thiel, while clearly a brilliant entrepreneur and investor, is not a natural public speaker. He gave a very high-level, big-picture talk without any actionable insights. He started by discussing forms of progress and moved on to important questions to ask when starting out, which include: What is valuable? What can I do? What are others not doing? The audience was then invited to ask two questions, and the first person picked asked the same question everyone in Berlin asks at these events: What did Peter Thiel think of the Berlin ecosystem? To which he replied that Berlin is missing one extraordinarily big success, which is right on. For the Berlin ecosystem to thrive, investors and entrepreneurs are going to have to take more risks. The event blew me away. Not only was the organization flawless (Hans, Aydo – well done!) but it showcased a new, more grown-up Berlin. The previous events I’ve attended in Berlin typically fell into one of two categories: (1) Berlin is AMAZING – we are on the path to be the next Silicon Valley! or (2) We aren’t growing fast enough, how can we be the next Silicon Valley? The Hy Summit showed a more mature side of Berlin, comfortable in our position in the world. In 2013, everyone was talking about hype. So far this year, we’ve seen real progress, especially in terms of funding. Since January, Delivery Hero announced a whopping $88m, Outfittery raised a €13m funding round, TVSMILES closed a $7 million Series-A funding round, and a handful of other companies including Clue, Sensorberg, and Mbrace have raised sizeable seed rounds. The startup system is growing and, while there is plenty that needs to change, especially when it comes to raising funds, for the first time everyone seems realistic about Berlin opportunities. With that, the networking part of the evening commenced. 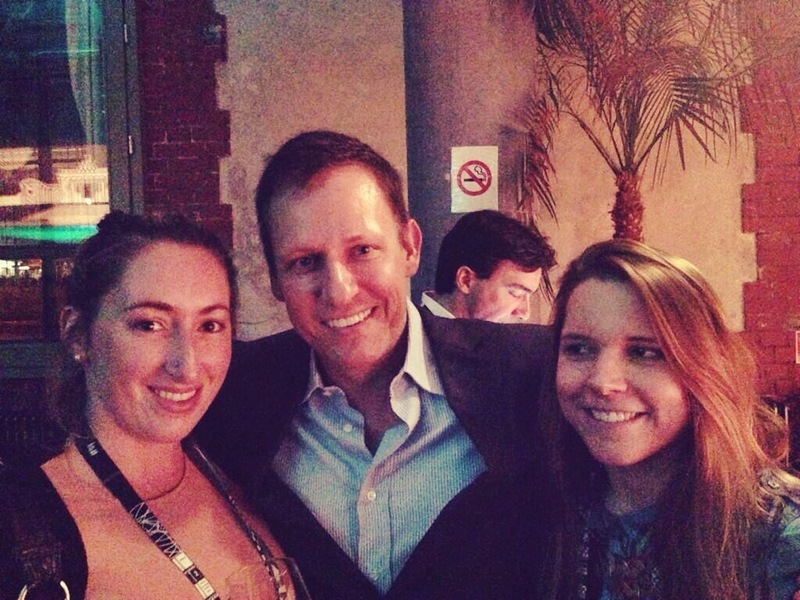 Because this is Berlin, and not the US, I walked up to Peter Thiel and asked to take a selfie because I am American and have no shame. So here it is. Ola and I chillin’ with P’ Thizzle (caption provided by Johanna of Frestyl).